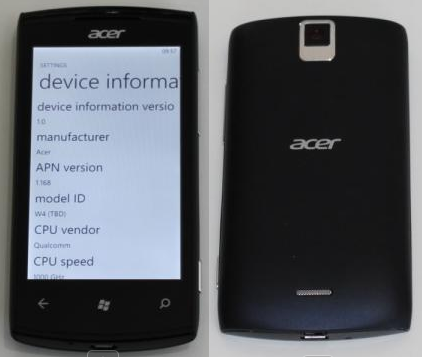 Although we're note exactly hearing anyone clamoring for an Acer Windows Phone, at least not with the reported specs that the Allegro has on board, it's still nice to see a low to mid range offering for those in the market. TelecomPaper is reporting that the Acer Allegro is set to go on sale in Europe this holiday season (think Christmas) for EUR 299, which ain't exactly cheap for Europe, it isn't too bad either. So it's basically a Mango phone with Gen 1 features. Not bad, not great. Thanks, TheWeeBear, for the heads up!